By guest blogger Annie Spiegelman, a.k.a. the Dirt Diva. Throughout history we’ve seen civilizations rise and fall based on how they treated their land. Dirt! 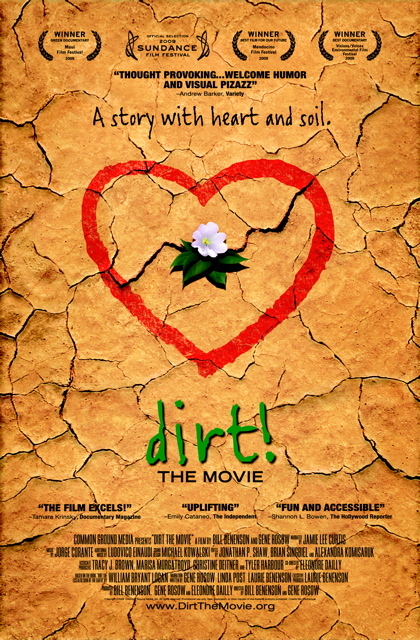 The Movie, by filmmakers Gene Rosow and Bill Benenson, is a film based on the book Dirt: The Ecstatic Skin of the Earth, by William Bryant Logan. Both the book and film propose we renew our faith in soil as a living, breathing, matrix for all life. And as a source of our spiritual regeneration, as well as our physical survival as a species. This is hard to wrap your head around, especially if you’re from New York City, like yours truly, but that’s why you must see this film! In it, more than 25 renowned global visionaries come together to share their wisdom on repairing this precious natural resource. Proving once again, that brown is the new green. 2. A handful of soil contains tens of billions of creepy-crawly microorganisms. These organisms keep plants, animals, and the planet alive. 3. Industrial farming is eroding the soil and disrupting its structure. We’ve lost a third of our topsoil in the last 100 years. 4. When there are miles and miles of only one species and one variety growing on our farms, as there is in modern-day industrial agriculture, this creates a vulnerable system. Monocultures are dangerous to our future. Diversifying crops on our farms, especially in drought, can keep the system from collapsing. 5. When we grow just one species on our farms, it’s an all-you-can-eat restaurant for pests. Once a pest learns to unlock the key to that plant, you have a pest infestation, and then you add pesticides. Exposure to pesticides, especially in children, has been linked to higher birth defect rates, cancer, learning disabilities, and abnormal hormonal changes. 6. Insects and plants are so like us physiologically, cell to cell, protein to protein, gene to gene, that if a pesticide is going to kill plants and insects, it’s going to kill humans, too. Ta-da! Repeat after me: Compost, compost, compost. 8. When the land is dead and we add synthetic nitrogen fertilizer to feed the crops, only about 20 percent goes to the plant roots. In the Midwest, the rest of the wasted fertilizer flows into the rivers and streams, and then into the Gulf of Mexico. This excess fertilizer feeds algae that grow and suffocate nearly all of the marine life, creating “dead zones” where only jellyfish survive. This mobile nitrogen combines with oxygen, which forms nitrous oxide and rises into the atmosphere accelerating climate change. Twenty-five percent of greenhouse-gas emissions come from agriculture. 9. In India, farmers have been pushed to buy more genetically modified seeds, chemical fertilizers, insecticides, and tractors. Now a farming activity that was zero cost is increasingly expensive. 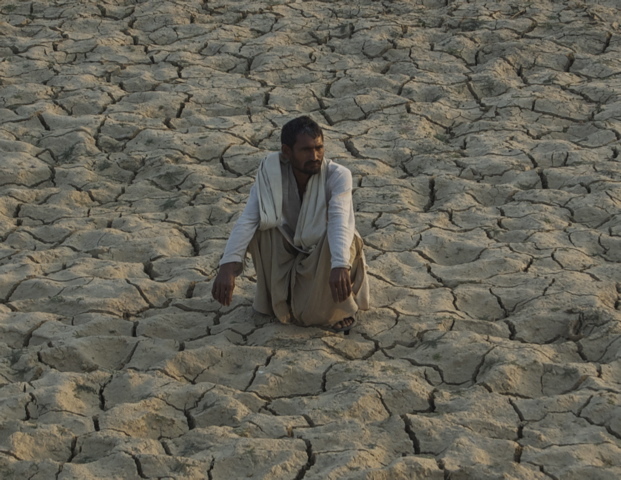 In India, over the last decade an estimated 200,000 farmers have killed themselves, many by drinking the pesticide they can no longer afford. As farmers around the world go broke and lose their farms, their land is taken over by international agribusinesses that grow genetically modified single crops for a globalized economy. 10. Each year 100 million trees are turned into 20 million mail-order catalogues. Come talk dirt and nerd it up with Annie at www.dirtdiva.com. 7 Responses to I Bet You Don’t Know Jack about Dirt! Bayer & Monsanto 2 of several evil entities in this terrible game they play w/ poor Indian farmers. 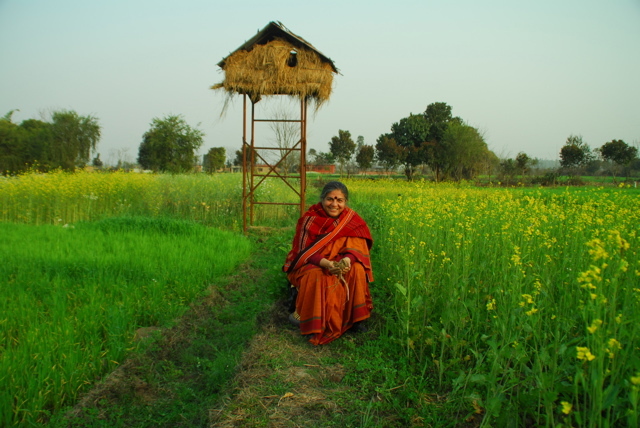 I recently read 1 farming county in India has gone completely organic! No chemical agriculture allowed. Hopefully, they’ll set an example for the rest of the country. Now our gov’t MUST stop subsidizing these millionaire soy & corn “farmers”. Monsanto set it’s sights on these 2 crops because of this subsidy, thus created GMOs, and the low cost of the high fructose corn syrup ( because of the subsidy) made from these genetically modified crops has replaced cane sugar which in turn has ruined America’s health, if not just their waistlines! OUR taxes pay for all of this! This post was so valuable because the ‘source of life’ is in our dirt. Adam was created from the ‘dust’ of the earth, it’s no wonder we need so many HSO (elements from the soil) to help keep us in good health. Note, if you have a dog, they smartly eat dirt regularly, more when they are not feeling well. And this post clearly points to the intentional destruction of our planet all for $$$. The more we support our organic and local farmers the better. Having planted veggie gardens, I’ve learned it’s a very sophisticated craft. 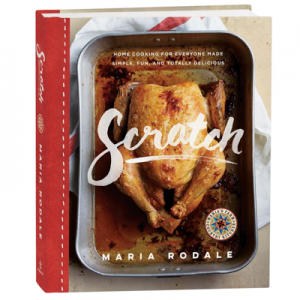 Thanks Rodale for standing for and being a source for our wellness. 2. “A new study, conducted by a team of student researchers in the Department of Rural Economy at the University of Alberta in Edmonton, Canada, showed that the greenhouse gas emitted when the produce is transported from great distances mitigates the environmental benefits of growing the food organically.” So if you’re not buying locally grown produce (and that includes any processed organic food like cereal, canned, jarred), you’re a fool. @Alex: I believe that the ‘new study’ you’re referring to was done in 2007 (by college seniors, I think, and not published in a scientific journal), and it seems all they did was compare the carbon emitted by transporting organic food and non-organic food to market. Of course the food that travels the longer distance produces more emissions. Is anyone arguing that organic food is lighter or not affected by gravity? But the environmental impact of food goes beyond transportation (in fact, transportation is probably not the biggest factor). That study didn’t measure the carbon emitted by producing either type of food, which is where organic beats out chemical. And of course they didn’t factor in the carbon that’s added to the soil by using organic growing methods. And, finally, measuring food miles says nothing about what toxic substances were used to grow the food, are present in and on the food, and are leaching into the surrounding soil and water. Which, if you’re buying local food that’s not organic, is likely the same water you’re drinking and bathing in. Now who’s foolish? 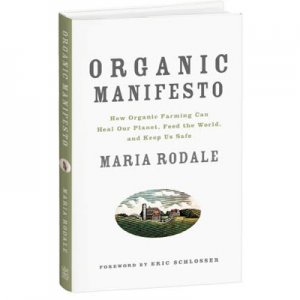 As for “Organic food not healthier, study finds,” we examined that here: http://www.rodale.com/organic-foods-and-nutrition . But beyond the flaws of that study, it’s important to remember that there’s more to the story than just how many antioxidants are in a given tomato. So, the “senior editor” didn’t bother to address point 1 because it is rock solid; didn’t actually disagree with me that locally grown organic produce are more environmentally friendly; and lastly, failed to see the irony of Rodale Inc publishing an article on hydroponic (soil free) farming, when its CEO, who has a history of posting unsubstantiated nonsense on her blog, posts about a hysteria film on soil. Please, please take Rodale Inc public so I can short sell the stock. Alex: When you reach beyond the simplistic nutritional definition of “healthier” there is no argument. Who wants poison in our drinking water? Who wants poison in the air we breathe? Who wants to eat poison on our food? And, yes, locally-grown organic food is certainly more environmentally friends. But, locally-grown food sprayed with synthetic pesticides and herbicides does not necessarily beat out organic food that has been shipped cross-country. Life-cycle carbon accounting indicates the production of synthetic pesticides, herbicides and fertilizers gobbles up a huge percentage of farming’s footprint. Oh, and why both reading the blog if you hate it so? Alex. I suggest you look at the following link for a more unbiased Rutgers study. Just as pharmaceutical companies have infiltrated & influenced education in our medical colleges, and commercial pet food companies have done the same w/ our veterinary colleges, it is apparent that conventional agricultural industries have done the same w/ some colleges. The influence, strongly supported by donations to the college, unfortunately skew truthful test results. EVERYTHING can be corrupted when it comes to money.